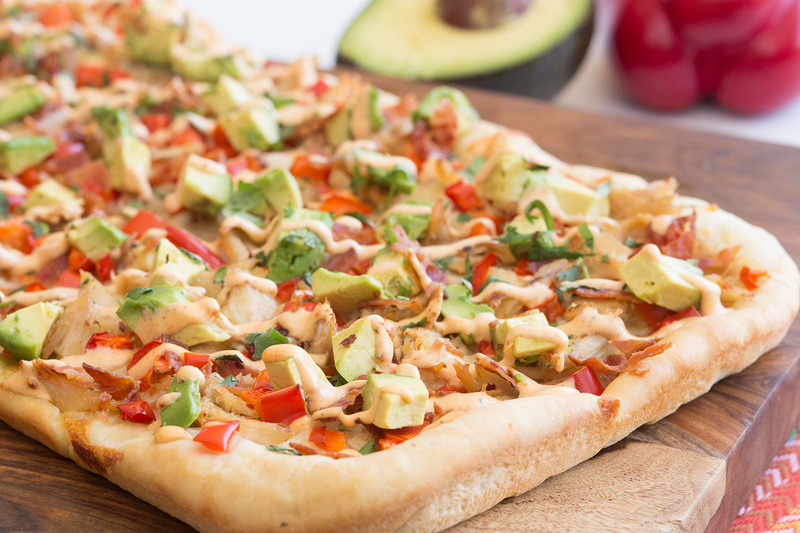 This flavorful flatbread is sure to hit the spot! Spray counter lightly with cooking spray. Combine rolls and roll into an 11 x 15 inch rectangle. Place dough in a sprayed 9 x 13 inch baking pan. Brush the dough with olive oil. Poke with a fork several times to prevent bubbles from forming. Pre bake at 350 degrees F 12-15 minutes. Remove from oven and cool slightly. Sprinkle evenly with cheese, chicken, red pepper and bacon. Bake an additional 8-10 minutes or until cheese is melted. Remove from pan and place on cooling rack. Combine ranch dressing and chipotle seasoning and mix well. Arrange avocado on top of bread, sprinkle with cilantro and red pepper flakes. Drizzle with seasoned dressing.